The Tourist Walnut Stain Cane is only cut in its dormant stage, this wood is naturally aged in a climate controlled facility for up to 2 years. 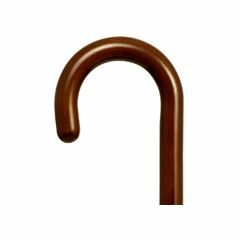 The handle is then steam turned and the cane is kiln dried, ensuring the strength, stability and reliability required for daily use. it from traveling up the shaft and into your arm. As a natural wood product, each unit is unique unto itself, making your cane a true personal expression. I have recommend this to others. Well Constructed. Supports Weight. Easy To Use. Safe. Lightweight. It was described as wooden with a walnut finish. What arrived was a plastic cane. Not happy, but it helped. Is it wooden like it says, or is it plastic like a reviewer claims?